I’m still of the opinion that the game Rochambeau is unclutter-wonderful because it requires no equipment. If you have hands, you can play Rock, Paper, or Scissors whenever you want. You can even play it alone if you have two hands. The founder of RideSpring discusses how he created a company to help unclog the roads across the US. Better Homes and Garden has some interesting ideas for small bathrooms. Stop printing out web pages and instead take notes and highlight web pages directly in your Firefox browser. Most people figure that “bigger is better,” but that isn’t necessarily true for an HDTV. 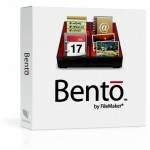 Back in May, I reviewed the iPhone version of Bento, Filemaker’s personal database application. There were a couple comments asking whether Bento supported encryption and sharing, and, as of yesterday, I’m happy to say that it does. Bento 3 was released yesterday, and they’ve added not only the ability to secure fields and share libraries over your home network—just like iTunes—but Bento integrates iPhoto so you can create personal databases that help you organize photos, iCal events, emails, Address Book contacts, spreadsheets, lists, PDFs you’ve created with your ScanSnap, and pretty much any other clutter in your digital life. Be sure to check out the Bento Template Exchange to check out database templates other users have created, or share your own. Bento is $49 ($29 upgrade). Make a cleaning map for a child’s room, showing where everything is to be stored. Include items such as compact discs, shoes, books, stuffed animals and dirty laundry. Not only is this fun and educational, but the child also has no excuse about not knowing where to put away items. How do you inspire your children to do chores? Let’s keep the conversation going in the comments. There is also free for download on the site a beautiful After School Routine Poster. Check out more back-to-school printables from Living Locurto. 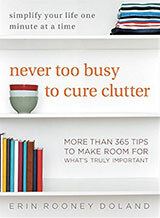 “Treat your computer desktop just as you would your desk, keeping only active files and shortcuts visible,” says Lorie Marrero, author of The Clutter Diet: The Skinny on Organizing Your Home and Taking Control of Your Life. A “cluttered” computer screen is harder to look at, making you feel jumbled. Go through folders and delete what you no longer need. Archive older stuff you want to save to backup storage (a CD or external hard drive). Check out the full article and add your own reasons to the list. You may even spot a few quotes from me in the text! Go on and check out the article, and then come back here and share your reactions. Expensify.com tracks your business expenses making expense report filing a breeze. In the vein of baby toy alternatives, Simple Mom has a great list of cheap and free toys for your toddler. Out-of-the-box solutions can solve your garage organizing problems, or at least give you inspiration for how to create your own. With custom-built cabinets, this home office is a tranquil paradise. It’s time to clear the clutter and get started on your goals. 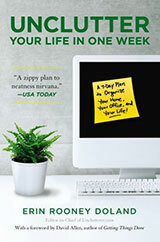 Are you taking the time to enjoy the benefits of your organizing and productivity efforts? In the story of Goldilocks and the Three Bears, the pesky Goldilocks is able to quickly find the bowl of porridge, chair, and semi-firm mattress that all meet her definition of just right. Granted, she has a limited set of options from which to choose, but she loves her choices so much that she is blissfully able to drift off to sleep in a den of BEARS at the end of her decision-making day. In my life — thankfully without much threat of deadly wildlife mauling me — I struggle to find that point of just right with everything. How many pairs of jeans, shoes, spare rolls of toilet paper, rechargeable batteries, and baby bottles should I own? How much time should I spend working, socializing, sleeping, and exercising to feel my best? Is my house too small for my family’s changing needs? How much space can I commit to storing this type of good? How much space do I want to commit to storing this type of good? Will I use all of it before it expires and/or becomes outdated and/or my brand loyalty changes? Do I need or want this item at all? How much time, money, and energy will I save in the future if I have more than one of these in my space? What will I do if I run out? Would having more or less of these items improve my quality of life? Regardless of how good a deal is, I stick to this method of determining just right. What method(s) do you use? Tell us about it in the comments. As a recent graduate, I am stuck with a graduation gown that will definitely not be worn again (the school is changing the gown colors next year, so no luck in passing it on down). I also have my high school gown tucked away somewhere. What is the best approach to get rid of these things? Are there places that accepts gowns to remake new gowns or something else? I have found the tassel to be a small and simple ornament. And the hat? Not sure what to do with that either. You have the traditional three options: sell it, recycle it, or throw it away. To try and sell it, pair it with the hat and throw it up on eBay. In March or April you might find someone at a different school with the same colors who might need one on the cheap. If you want to recycle it, I would suggest contacting a local preschool and asking if they want it. They could use it in their dress-up and imagination stashes. Local theaters might also have a need in their costume departments. If the fabric is of decent quality, you could cut it up and repurpose a little of it into a quilt or garment. Another idea might be to simply give it to a friend with kids who might enjoy using it for dress-up at home. Check out the comments for even more recycling ideas from our readers — they always have great ideas for repurposing items. Finally, you could just throw it away. Take a photograph of it (if you don’t already have a picture of you wearing it during your graduation ceremony) and then put it in the trash. Most graduation gowns are made of extremely cheap fabric that will quickly decay. Thank you, Eri, for submitting your question for our Ask Unclutterer column. Congratulations on your recent graduation! 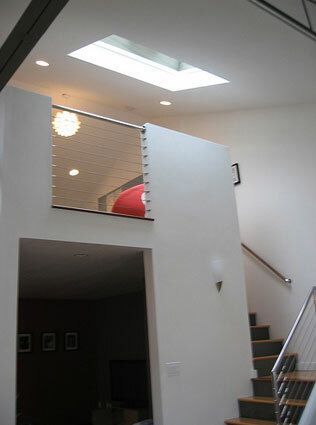 These pictures showcase an amazing space. They images say more than I ever could write about them. 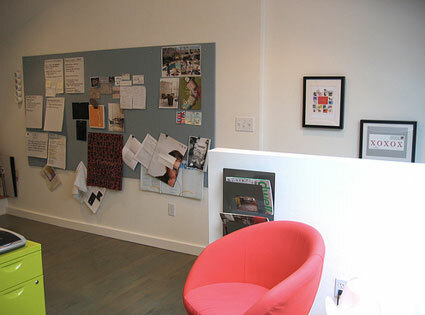 The only thing I want to add is that JVOdesign linked to her instructions for how to make the tack wall. Thank you for such a terrific submission, JVOdesign. 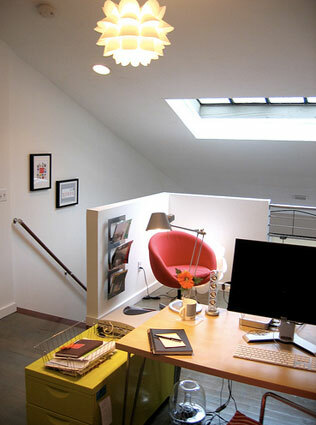 I would love to work in this space. 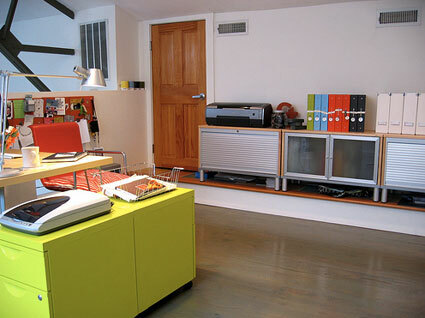 Organizing small things, specifically small things you regularly need at your fingertips, can be frustrating. Most of the pre-made organizing products for small things aren’t very attractive and/or are made exclusively for drawers. It’s available in white and black, and perfect for the lotions, shampoo, body wash, nail file, and dozens of other little things my son needs that I don’t use. 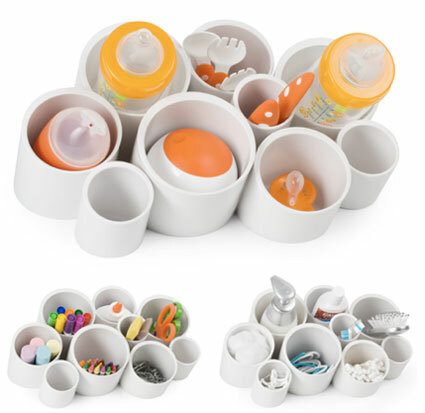 It can easily be repurposed in the future to hold craft and office supplies or tiny toy parts if we ever move into a house with built-in bathroom storage.